Nitrocatechols are able to covalently link to metal and metal oxide surfaces. Because of the stabilizing nitro-group, the compounds are resistant to oxidation at higher pH values than is the case with their parent catechol derivatives. Nitrodopamine and nitrodopa can be used for amination, introduction of surface charge and electrostatic stabilization of particles. In addition steric stabilization and protection from biofouling, can be obtained using the PEGylated or dextran functionalized compounds. Specific binding can be obtained using biotin-neutravidin coupling schemes. Perfluorophenyl azide (PFPA)-functionalized nitrodopamine can be used as an adhesion promoter for nonspecific UV-activated binding of most molecules that are in proximity to the functionalized surface. Functionalization of magnetic nanoparticles for magnetic-resonance applications. The siderophore Anachelin H, isolated from cyano-bacteria, was found to have an extreme binding capability for dissolved iron(III) ions due to the presence of a double-ring structure consisting of a catechol and a quaternary amine, known as anacat . Nitrodopamine and nitrodopa are synthetic mimics of anacat and have proven to be powerful surface-active compounds that are useful for bioresistant surface functionalization  and hydrophobization of various substrates . In addition they are very strong binding dispersants for magnetite [4a-e] and other nanoparticles . In addition to the lower pKa of the hydroxy groups compared to pyrocatechol, the main advantage of this new class of surface-active molecules is their high stability against oxidation, even at basic pH, proving them superior to non-modified catechol derivatives in a range of applications, especially the stabilization of nanoparticles. In comparison to electrostatic binding, nitrocatechols form covalent coordinative bonds with a range of metallic and metal-oxide surfaces, such as TiO2, Fe-based materials (steel, magnetite particles), alumina and gold. Zürcher, S.; Wäckerlin, D.; Bethuel, Y.; Malisova, B.; Textor, M.; Tosatti, S.; Gademann, K. Biomimetic surface modifications based on the cyanobacterial iron chelator anachelin. J Am Chem Soc 2006, 128 (4), 1064–1065 DOI: 10.1021/ja056256. Malisova, B.; Tosatti, S.; Textor, M.; Gademann, K.; Zürcher, S. Poly(ethylene glycol) adlayers immobilized to metal oxide substrates through catechol derivatives: influence of assembly conditions on formation and stability. Langmuir 2010, 26 (6), 4018–4026 DOI: 10.1021/la903486z. Rodenstein, M.; Zürcher, S.; Tosatti, S. G. P.; Spencer, N. D. Fabricating chemical gradients on oxide surfaces by means of fluorinated, catechol-based, self-assembled monolayers. Langmuir 2010, 26 (21), 16211–16220 DOI: 10.1021/la100805z. [4a] Amstad, E.; Zürcher, S.; Mashaghi, A.; Wong, J. Y.; Textor, M.; Reimhult, E. Surface functionalization of single superparamagnetic iron oxide nanoparticles for targeted magnetic resonance imaging. Small 2009, 5 (11), 1334–1342 DOI: 10.1002/smll.200801328. [4b] Amstad, E.; Gillich, T.; Bilecka, I.; Textor, M.; Reimhult, E. Ultrastable Iron Oxide Nanoparticle Colloidal Suspensions Using Dispersants with Catechol-Derived Anchor Groups. Nano Lett 2009, 9 (12), 4042–4048 DOI: 10.1021/nl902212q. [4c] Amstad, E.; Gehring, A. U.; Fischer, H.; Nagaiyanallur, V. V.; Haehner, G.; Textor, M.; Reimhult, E. Influence of Electronegative Substituents on the Binding Affinity of Catechol-Derived Anchors to Fe3O4 Nanoparticles. J Phys Chem C 2011, 115 (3), 683–691 DOI: 10.1021/jp1109306. [4d] Amstad, E.; Textor, M.; Erik Reimhult. 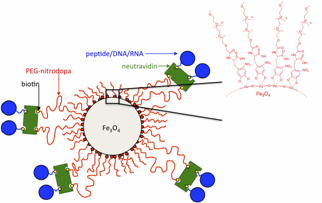 Stabilization and functionalization of iron oxide nanoparticles for biomedical applications. Nanoscale 2011, 3 (7), 2819–2843 DOI: 10.1039/c1nr10173k. [4e] Lassenberger, A.; Bixner, O.; Gruenewald, T.; Lichtenegger, H.; Zirbs, R.; Reimhult, E. Evaluation of High-Yield Purification Methods on Monodisperse PEG-Grafted Iron Oxide Nanoparticles. Langmuir 2016, acs.langmuir.6b00919 DOI: 10.1021/acs.langmuir.6b00919. Morgese, G.; Causin, V.; Maggini, M.; Corrà, S.; Gross, S.; Benetti, E. M. Ultrastable Suspensions of Polyoxazoline-Functionalized ZnO Single Nanocrystals. Chem Mater 2015, 27 (8), 2957–2964 DOI: 10.1021/acs.chemmater.5b00252.